The Hozelock Ecopower 6000 filter is suitable for ponds up to 6000 litres (1320 gallons) and it is easy to disguise when positioned near the pond. Ecopower filters are the affordable answer for clear and healthy water in garden ponds when used alongside a compatible pump. All Ecopower filters contain a UV clarifier. 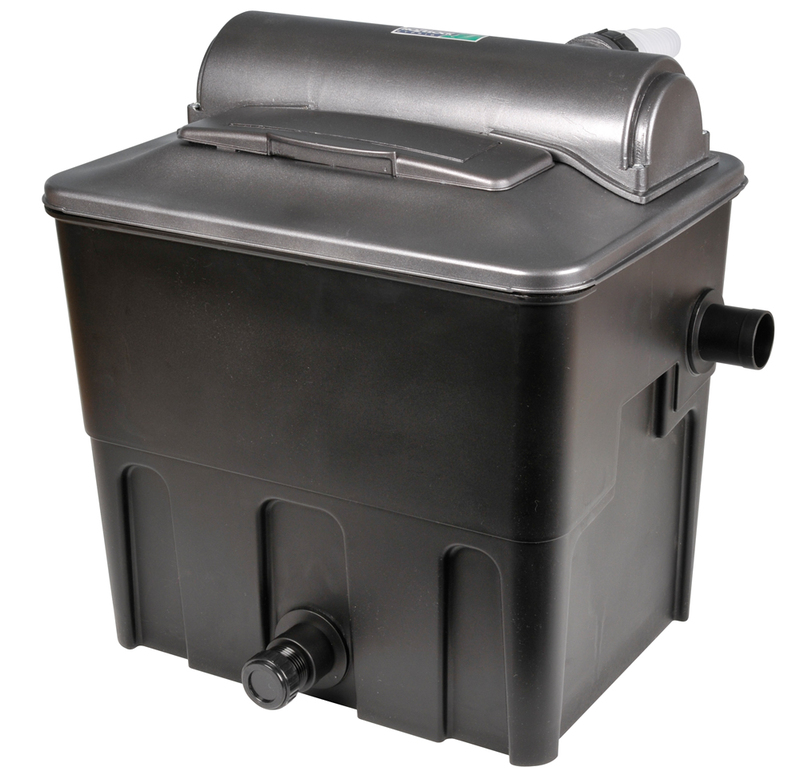 Ecopower filters are the affordable answer for clear and healthy water in garden ponds when used alongside a compatible pump. All Ecopower filters contain a UV clarifier. Water enters the unit and passes close to a UV-lamp, separated from it by a quartz sleeve. UV light makes algae clump together so it can be caught by the foam. Water leaves the UV chamber via a spray head, which aerates the water for a high oxygen content. Solid particles in the water are trapped on a foam sheet. Almost solids free, the water passes through plastic biomedia where beneficial bacteria cleanse pollutants. 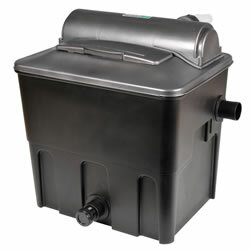 The amount of biomedia contained in the filter increases in proportion to the size of filter / pond. Clear healthy water then passes up an outlet tube and back into the pond. Integral carry handles are positioned in the side of the filter to make the filter easy to lift if maintenance is required. Viewing hatch to observe the internal operation of the filter, in particular whether and maintenance is needed.